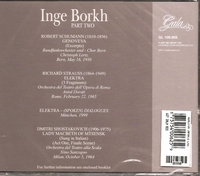 "Unlike most German sopranos, Inge Borkh possessed a lyric warmth not often associated with the German Fach and which also blessed singers such as Frida Leider and Lotte Lehman. As a young kid I learned my first TURANDOT through her Decca recording and I still have an undiminished enthusiasm for it in spite of some deficiencies, for Inge Borkh is still the least 'icy' sounding princess in recorded TURANDOT history. Borkh is too often associated with Strauss alone; the soprano had a much more varied repertory in which she excelled. Borkh initially wanted to become a stage actress and thus it is no wonder her enunciation is always so well-rendered with every word perfectly clear. Even as a young girl she impresses with her enthusiasm when at age 14 she recorded a Ralph Erwin song. Ralph Erwin, an indirect Nazi victim (1943) and of Richard Tauber fame ('Ich kuesse ihre hand, Madame') would have loved her unspoilt go at 'Man hat's nicht leicht'."